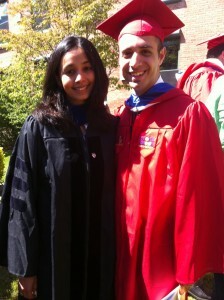 Dr. Ayesha Ramachandran (L) and Mike Vidafar (R), May 25, 2011. Back from the dead, I began commuting back and forth to school. It was long, and difficult. I had my problems — mainly with getting to class on time. But I became better at managing my time. I worked two jobs, and never fell behind on papers. Even if I didn’t get through my reading, I would make sure that the assignments were complete. I participated in class, and I started to build a reputation as someone who belonged in the program. My struggles in other classes (archaeology, French, Italian) were blips, because I had become singularly focused on my writing and reading. I worked hard to treat school like a job (or rather, training for a job) and when I had finally managed to graduate, I felt like I had really learned something. A set of skills that would prove invaluable in my lifetime.